Sometimes you discover a product and it makes your life so much easier that you wonder how on earth you coped before you owned it. This post is sponsored by Buddy Wagon. The post contains an Amazon affiliate link which means I receive a small commission if you buy through that link at no extra cost to you. 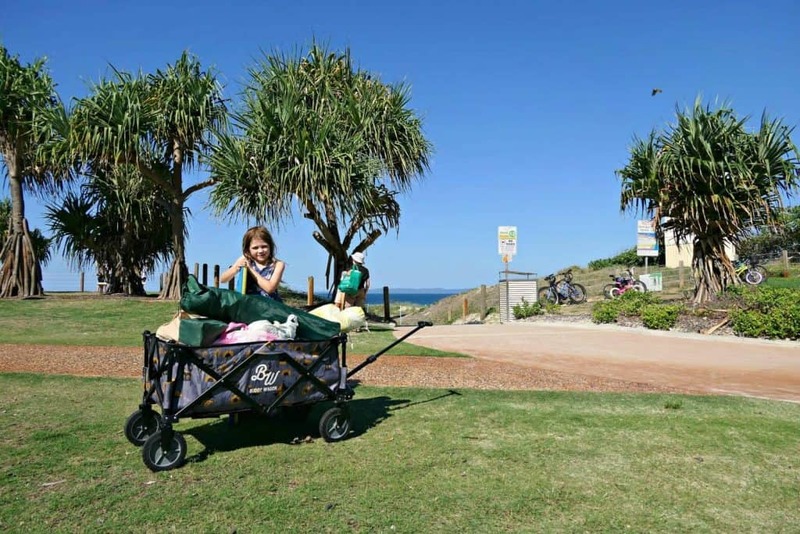 Over the last few weeks, I’ve been trying out a new travel accessory…the stylish Buddy Wagon collapsible wagon that can be used as a kids wagon, a beach cart or a sports wagon to drag the endless amount of gear that kids need for an afternoon in the great outdoors. 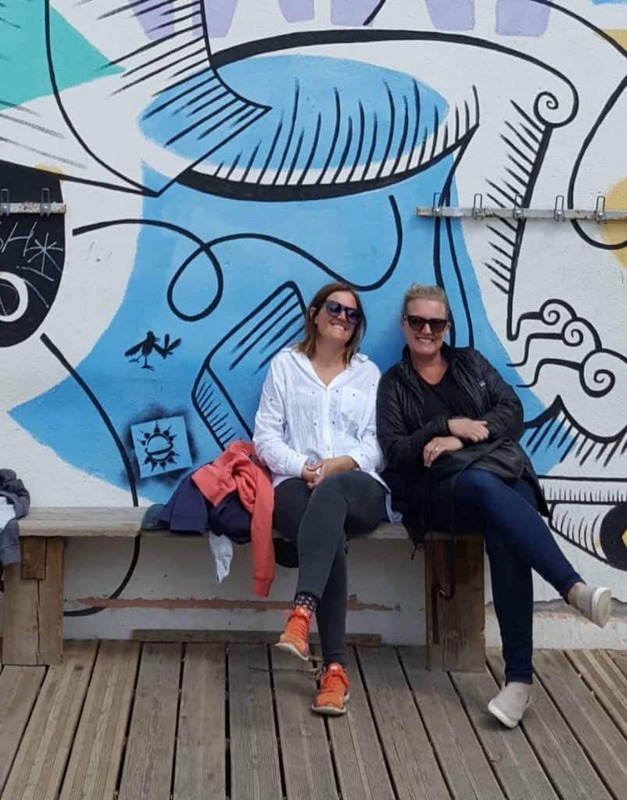 Buddy Wagon is an Australian brand from a couple of real-life buddies called Jen and Danni who have been friends since their school days. 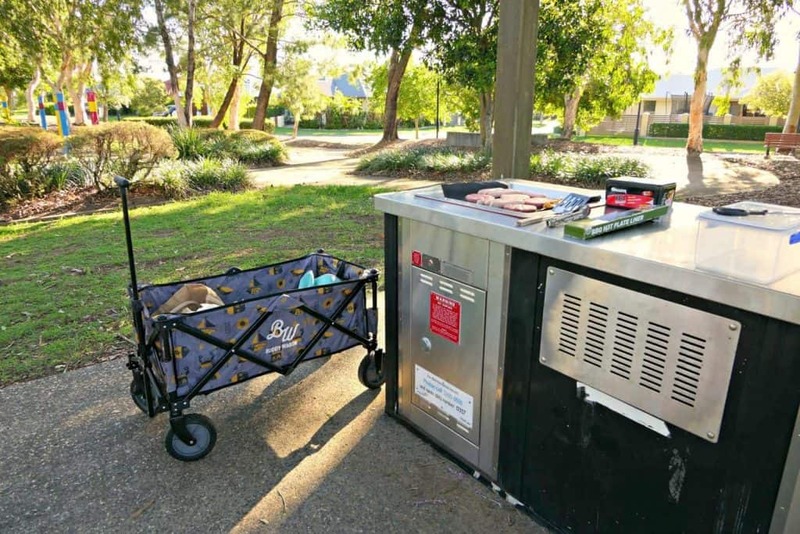 I became aware of the idea of folding carts in Australia when we used to go to the Nippers session at the surf club not long after we moved here. I needed to carry x 3 towels, x 3 changes of clothes, lots of bottles of water, endless snacks…you get the drill. 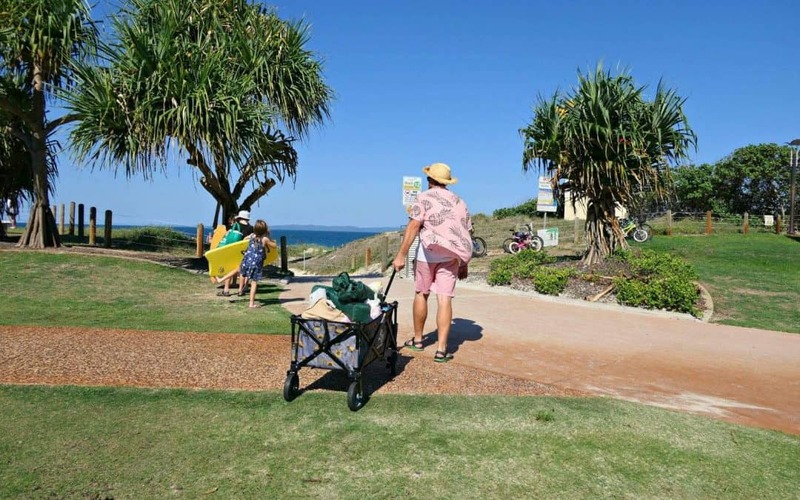 One day, I was struggling trying to carry all of my bags to the beach when I saw a friend breeze by me with a folding beach trolley full of her gear – I was so envious! I went on to buy a few versions of collapsible carts and rolling beach trolleys and pull along cool bags but none of them lasted under the weight of our gear or they had too many design flaws. I was really excited to see how the Buddy Wagon beach cart would perform. As a family of five, we don’t travel light so I knew we’d put it through its paces! Our Buddy Wagon has become a really helpful addition to our family – someone who carries all the things and stops those awful family arguments! My kids affectionately call it ‘Buddy’ as if it’s a real, living breathing member of our family! I’m currently reading an amazing book called The Power of Moments by Chip and Dan Heath. The book talks about how you can consciously create special memorable moments in life by carefully crafting experiences. The book is about how businesses can create memorable experiences for their customers, how institutions can create incredible learning experiences for their students but what I’m taking away from it is how simple things you do can create a lasting impression on your children. You can easily turn experiences that aren’t memorable (or experiences that are negative experiences) around into positive, lasting childhood memories. We go to the beach as often as we can as it’s our happy place. 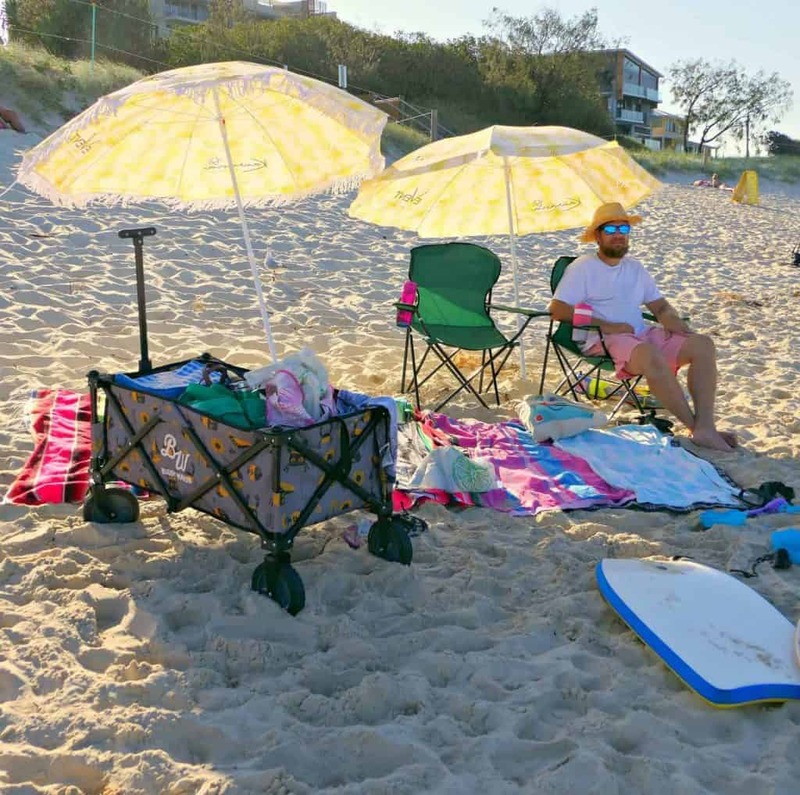 Often the experience involves a grumpy start as we unload a car full of beach chairs, umbrellas, rugs, cool bags, snacks, body boards, buckets and spades and try to work out who is going to carry it all (spoiler: it’s usually me and my hubby!). The kids ALWAYS put up an argument and say they can only manage to carry one bucket and spade each. Then the fighting starts and the kids bicker and we all fall out before we’ve even made it out of the car park. For me, this is where the Buddy Wagon comes into its own. It holds everything, and our kids are so excited about getting it loaded up and taking turns to pull it – the Buddy Wagon takes care of it all! We actually get to arrive on the sand in a happy mood. This one product is helping us to create happier family memories together! When the Buddy Wagon arrived in its big box, I was eager to open it but I also know that building flat pack things is not my strong point so I usually hand things like that over to my husband (damn, I hate sexist stereotypes but he has a logical engineers brain and I have a creative brain that can’t be bothered with instructions!). He was out at work though, so I opened it determined that I’d figure it out and put it together without him. It turns out there is no flat pack to build! The Buddy Wagon cart arrives as it is, all together in one piece and ready to just unfold. Phew! About 10 seconds after unboxing it, I had it set up in my living room with my kids fighting over who was going to get the first ride! The Buddy Wagon comes wearing a protective, hardwearing canvas cover. This means you can easily store it away and keep it clean and safe. The cover is velcroed on to the folding wagon – this is a brilliant design feature as it means the cover is held in place and won’t pop off when it’s not supposed to. It also holds the whole thing together securely too. When the cover is on, you can stand the unit up and it doesn’t take up much space at all. 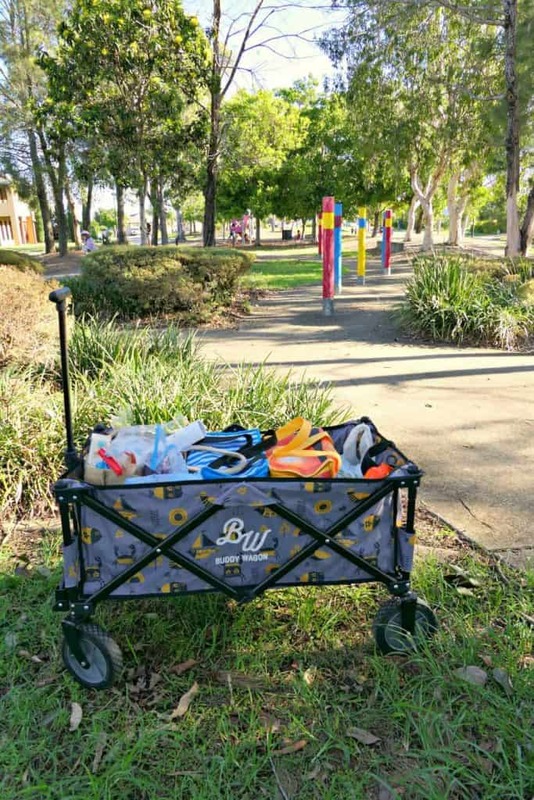 The Buddy Wagon cover has a handy handle so you can pull it around on wheels even when it is folded (and as it is held in place securely with strong velcro straps, the cover won’t fall off). When you take off the cover, the foldable cart literally just unfolds for you. It’s so smooth and simple. All you need to do to start using it is to unfold the hard base and place it in the base of the Buddy Wagon. The wagon can hold up to 70kg which is an awful lot of weight. Technically that means I could pull all three of my kids in it with a little weight to spare because my kids are all tiny, although the wagon label says it’s not recommended for carrying kids (I only put them all in it together for the photo to show you its size). Generally, people do use these sorts of wagons to pull their little ones in though and I would feel safe pulling my littlest in it – her legs get tired all the time so I can see it coming in very handy for that! I think it will be a game changer for long days at Australia Zoo and for big family days out. The actual flatbed space within the Buddy Wagon is very large (93cm x 48cm x 30.5cm) which means there is a lot of room – whether you want to use it for Eskys and/or small people!) I wish we’d discovered it sooner, as it looks like it also makes a great temporary cot for tired toddlers on beach days. The wagon is equally happy on concrete or on grass – the wheels cope with a bit of off-roading adventure fine. When we took it to the beach, we went to a part of the beach with really soft sand so we pulled it right down to the edge of the hard ground and then rather than drag it through deep sand with too much weight, we took the heaviest items out and then dragged it. It would have coped on compacted sand with spinning wheels but it was still helpful to have it even with the soft sand as it was easy to drag along. 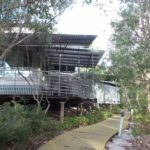 For us, the hard part at the beach is getting from the car park to the sand – that is usually a fair distance, especially if you go somewhere like Noosa or Byron Bay where parking can be very tricky so that is where it really comes into its own. I feel like they’ve really paid attention to details with the Buddy Wagon design. 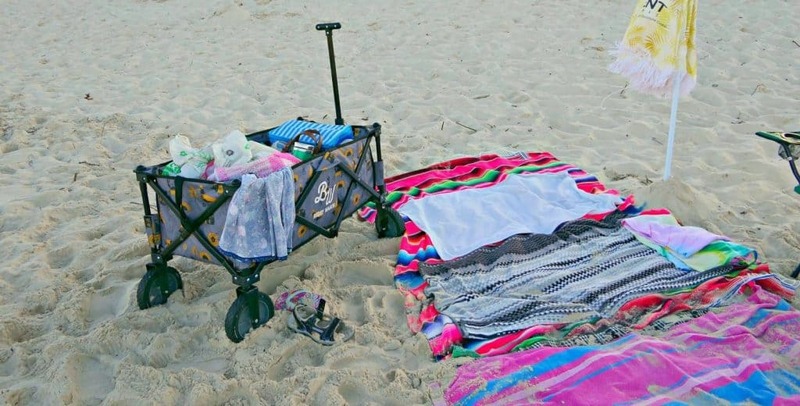 The canvas of the folding wagon is really heavy duty, and I feel confident stacking it with things, unlike some other cheap beach carts I’ve used before. It’s easy to wipe clean (handy when you travel with kids as we do!) I love how compact the Buddy Wagon is – it doesn’t take up much space at all (the folded size of 35cm x 20cm x 74cm) which is really handy when you’re going for a day out and have a car full of things. Actually, we often leave it in the boot of the car because you never know when you might need to use it when you’re out and about. The fold out flat base of the wagon ensures you’ve got a strong based to load your things into. It just feels like they’ve thought everything through. Are there any negatives to the Buddy Wagon folding cart? I’ve written lots of reviews of twin buggies before, and there are always as many negatives as there are positives for every product. I really thought beach wagons would be similar. But honestly, for the Buddy Wagon the negatives are almost non-existent. My husband would have liked a different end to the handle to make it more comfortable for him (he’d have liked a triangle shape that he could put his whole hand into as he found the width of the pole a bit wide for his fingers to sit comfortably) but I didn’t mind the handle shape and neither did the kids. It’s not the lightest foldable wagon around but then the lightest wouldn’t be the strongest and, for us, we wanted something strong and sturdy that we could rely on so its weight is a good thing for us. I wanted to give you a bit of background about how the Buddy Wagon came about. Buddy Wagon isn’t a massive US company like most other wagon brands are. It’s an Australian company run by a pair of old school friends called Jen and Danni who had young families in Victoria at the same time. When Danni relocated to the US, Jen came to visit and was introduced to the idea of a wagon culture that is popular over there. 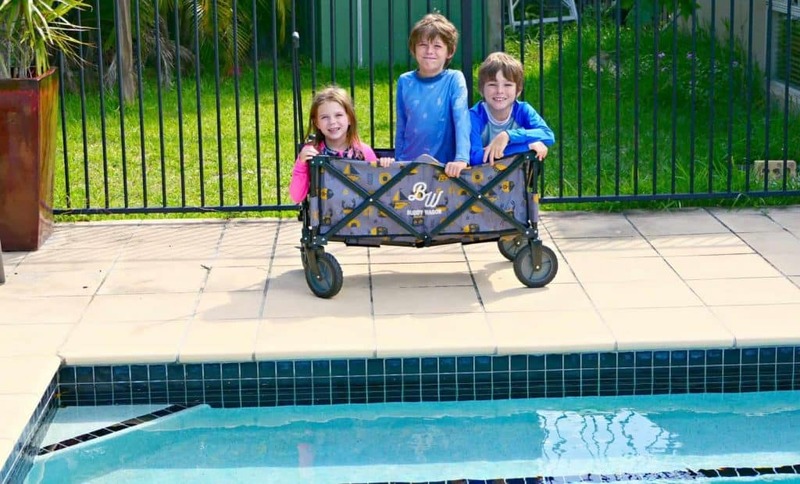 They realised that foldable wagons had the power to transform the lives of outdoor-loving Aussie families and they decided to create a business together. Over three years they’ve developed the design of a portable wagon that is strong and stylish, yet practical and hardwearing. 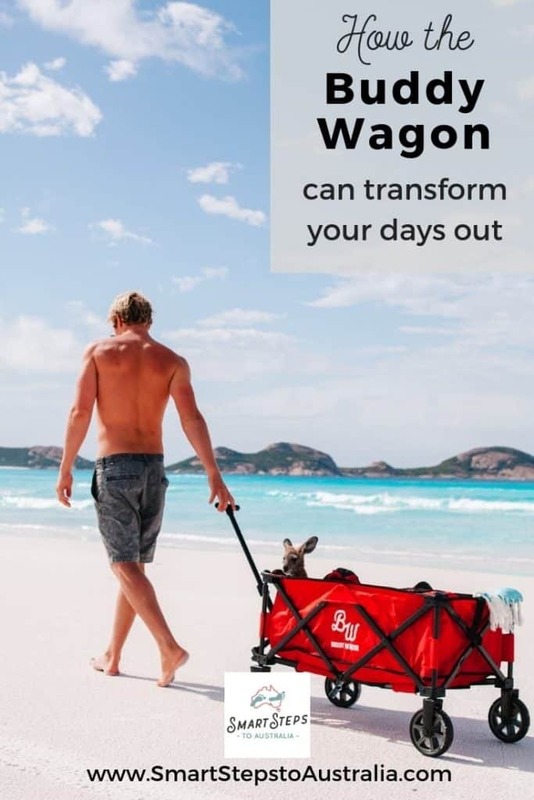 What began with their striking red design (available for $249) has expanded and they have embraced the Australian influence by having various Australian artists to design the fabric and creating limited edition wagons (available for $269). The current limited editions are the very pretty striped ‘The French Stripe‘ and the ‘Sandpiper‘ designs (the one we received). I chose to review the ‘Sandpiper’ design as I absolutely loved its sea-themed quirkiness and the fact that it was designed by a Noosa artist called Adrian Knott (we LOVE Noosa and it’s a place we would love to move one day so I love the local connection!). Adrian, known as Ado, is an artist/designer who spent years working on projects for top surf brands before deciding to make the move from Victoria to Noosa where he now shapes surfboards (you can read more about him here). Why choose a Buddy Wagon foldable cart? 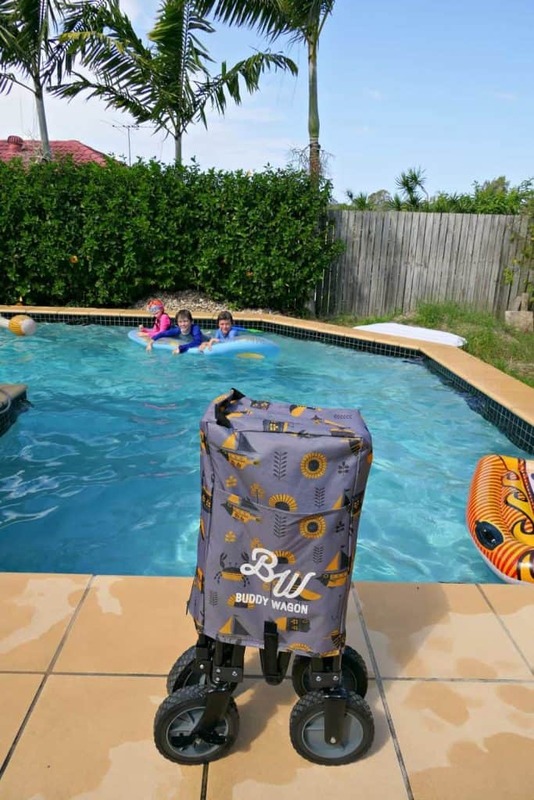 I think the Buddy Wagon has got the details just right – they’ve created a practical, strong, hard wearing product that is also an eye-catching, visual product. But more than that – they’ve created something that makes our days out about having fun and creating memories. I think everyone’s family needs a Buddy! 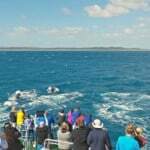 Is Fraser Island a family holiday destination?